CEA is for those with anterior circulation TIA or non disabling anterior circulation stroke and should be done on those with a symptomatic stenosis of > 70%. The doppler will show high velocities which generate turbulence and embolic stroke disease. The atherosclerotic stenosing plaque can also become unstable and cause total occlusion. There is nothing to be done once the vessel is totally occluded as the damage is done. It is surprising that patients can have asymptomatic complete occlusion of one or other carotid. The surgery should be done within days but definitely less than 2 weeks. Treat as a vascular emergency. Surgical expertise and general surgical care are important. 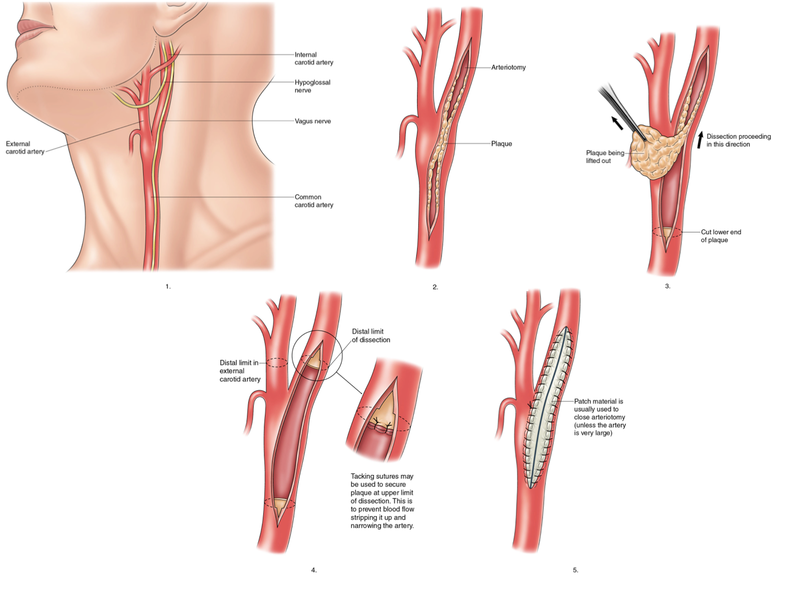 Carotid angioplasty and stenting is much talked about as an alternative to CEA but current evidence has not shown it to be superior to CEA and possibly to have higher complications. Avoid doing a carotid duplex on an asymptomatic patient or a patient where you cannot ascribe the symptoms to a particular carotid artery as there is no evidence for a surgical benefit. You need a "symptomatic artery"
The general consensus is that if you have a TIA (or non disabling stroke) and a scan shows a significant stenosis (>50% on NASCET scale) of the carotid artery then you are at risk of a major stroke (11% over 2 years). Careful studies have shown that this risk can be reduced to 6% by surgery. It would not be the practice to treat asymptomatic disease as benefits do not outweigh risks. Patients would be treated with Best Medical Therapy. The procedure involves an incision on the lateral aspect of the neck. It takes about 2 hours on average to perform, and usually necessitates overnight stay in hospital. It is possible to have the operation done under local or general anaesthesia. The major risk of the operation is that it will cause a stroke. This occurs in only 2-3% of cases and strenuous efforts are made to prevent this by careful surgery and monitoring. Despite the risk of the operation the overall benefit favours surgery if there is a significant stenosis. Other more minor complications include numbness around the wound, and disturbance of nerves to the tongue and throat. There are no age limits for the operation providing there is no other severe medical problems such as heart disease. There is a chance that surgery can lead to platelets aggregation and thrombus in situ around the area of the surgery or there may be a carotid dissection or plaque emboli and ipsilateral stroke. Needs a CT Brain to ensure no ICH and urgent angiography usually a CTA. If there is thrombosis then a step up in antiplatelet or anticoagulant therapy may be considered. Some surgeons may consider reexploration of the vessel. Stenting may be considered in some cases. This can occur in about 5% over 2 years and is usually due to neointimal hyperplasia (early) +/- new atherosclerosis (late). Usually treated with best medical therapy. Repeat surgery may be considered. Some may consider stenting and dual antiplatelet therapy. Surgery can lead to a loss of localised autoregulation as well as relief of stenosis can cause a hyperperfusion syndrome with oedema on the ipsilateral affected side and this can precipitate weakness and a stroke like presentation often with headache and seizures and even ICH. Needs CT brain or MRI (shows oedema) and good BP control with oral or parenteral agents. It tends to occur at Day 3 to Day 10 so is not immediate. can involve LMN lesions to the hypoglossal, vagus, and glossopharyngeal and even hypoglossal nerves. Usually due to traction on the nerves but some can be slow to improve and can be mistaken for new stroke. Some need 6 months to recover. If the nerve is transected repair may not occur. SUch damage tends to be associated with prolonged procedures (>2 hrs). usually seen within first 72 hrs. May be worsened by perioperative anticoagulants and antiplatelets. Needs good BP control. Manage as acute ICH. Smoking cessation, antiplatelets (aspirin 75 mg od or clopidogrel 75 mg od) and high dose statin and management of hypertension. Exercise and other lifestyle dietary measures and alcohol usage are wise.